I have a confession to make. I'm in love. I'm in love with a girl named Shiho Fujita, also known as sifow. She lives in Tokyo and makes records and is hands down my favorite j-artist, with a fantastic new album just released. I can't believe this girl is the same age as me - she has her own company, blog, store, album, and published book. There's a line in a Radiohead song, 'ambition makes you look pretty ugly.' I guess sifow never bothered to listen to that record, because she's looking pretty damn good to me. Part of the appeal of sifow for me is that she won't apologize for being gyaru; she appears in tanning beds in her videos, posts pictures of other gyaru on her blog, and promotes the style in written form. I almost wish she'd play this aspect of her persona up more. Her music feels like the most exciting parts of late-90's J-pop spliced together with a eurobeat feel and some old-school electronic action. It's rare to find j-music where 'techno' means anything other than a generic dance beat, but everything released by sifow to date has had absolutely first-rate production: her songs are always densely layered, filigreed with little touches of detail, cascading rushes of synth. Particularly, the synth-work in the original version of 'Jewel' conjures up memories of early-80's Rush or something (think 'Tom Sawyer'). Think how complex this song is: it has a full minute acoustic intro which segues into a verse, seguing into a chorus, then another verse, followed by a tremendous wash of digital production, followed by a guitar solo, followed by more synthwork and a chorus/outro. This is almost prog-level song construction, not pop. Hell, the opening track to her recently-released album, 'Clarity', opens with bagpipes. Who else is doing stuff like this anymore? It brings back memories of Ayumi Hamasaki albums like I Am... and Rainbow, those genuinely exciting Ayu albums where it felt like the rock and electronic elements were melding into something new instead of clashing. * And while Ayu has been pretty disappointing lately, sifow has more than taken up the mantle: I haven't heard j-pop this exciting or forward thinking in a long time. I'd even say her stuff rivals the recent Utada material in terms of integrating unusual instrumentation, electronics, and unconventional song structures. Sifow's weakness is her ballads, they tend to be more generic than her upbeat dance tracks, but this doesn't mean much: it takes a lot for j-pop ballads to stand out; how many can you name offhand? * And admittedly, if heard in a vacuum her voice wouldn't call attention to itself - it's thin and lacking range, but in her best tracks, it always manages to perfectly accomodate itself to its sonic surroundings. The difference is crucial: a technically superior singer like Koda Kumi can be less fun to listen to because of drab songwriting and an absence of hooks, while a sifow or Ayu can coast by on A-level production, slotting their voices to the hook. The choruses to 'Love and Peace', 'Clarity', and 'I Uta' are sticky as flypaper, easily withstanding triple-digit listens. Sifow's music also has an interesting 'trance' effect: the evenness of her vocals and the undertow of tracks like 'Clarity' and 'Chain' can result in a near-meditative state. It's a shame sifow seems to be catching on more in the West than in Japan. Apparently, avex hasn't expended much money in promoting her - more likely they're concentrating on the at-odds pair of Kumi and Otsuka and the still-reigning (but not for long, I suspect) Ayu. This is a shame, since I think sifow could eventually eclipse all of them, if she hasn't (at least musically) already. Keep watching: this girl could be big. And read her blog too! *this is different from electroclash the musical genre, incidentally. The recent Maki Goto single 'Some Boys! Touch' sounds like the Hello! Project version of electroclash, if that makes any sense. Think: Ladytron meets Tsunku. But serious, I Am... at least was awesome. It almost sounded like Homogenic-era Bjork in parts. *for me, it's roughly 'First Love', 'Sakura Mankai', and 'Kingyo Hanabi'. 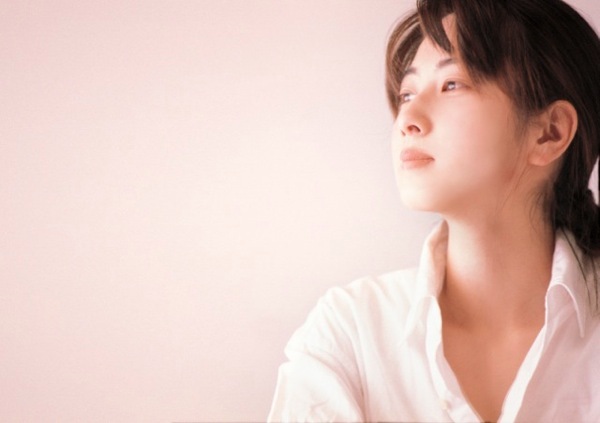 To listen to some of her other songs, go Channel-Ai's Sifow entry here.